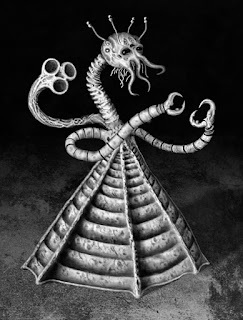 A few weeks back, I was asked if I'd be interested in reviewing a new Cthlulhu Mythos anthology. My own failed attempt to plow thru a shelf full of Mythos stories last winter inclined me to say no, but then I learned it was a themed collection: all the stories were set after the victory of the monsters. So I said yes. 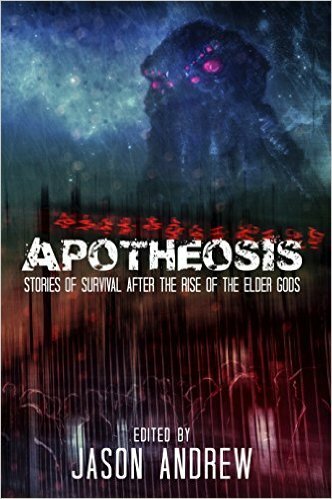 It's called Apotheosis: Stories of Human Survival After The Rise of The Elder Gods and is edited by Jason Andrew. The book is from Simian Publishing and is available in paperback and e-book forms. In all my years of (which is exactly 38 years, 3 months, and 17 days - The first HPL story I read was "The Festival" on the night of the NYC Blackout of 1977), I've come across only a few that dared to look at a world under the thumb of the Old Ones and their minions. In fact, the only one that leaps to mind is Basil Cooper's "Shaft Number 247" and it's over thirty years old. Too often, Mythos stories fall into familiar patterns involving all too familiar props. We all know them: things no man should know, Byakhees, inbred families, evil tomes, etc. There's only so many variations on those things even the best writers can do, so Apotheosis intrigued me even before I cracked the cover. Between the two covers of this collection of grimmer than the grimmest Warhammer Space Marine, are eighteen tales by authors I am mostly unfamiliar with. On finishing it, I found a few writers I'll keep a weather eye open for in the future and one or two I'll probably pass on. Apotheosis kicks off with one of the best Mythos stories I have read in a very long time: "The Smiling People" by Andrew Peregrine. In a city surrounded by a high wall built of rubble and bodies, the narrator and his fellow humans live under the constant attention of the titular Smiling People. In "The Pestilence of Pandora Peaslee" by Peter Rawlik, pro-human partisans attempt to overthrow the Yithians. Even though they've turned the Earth into a paradise of clean energy and halted global warming. 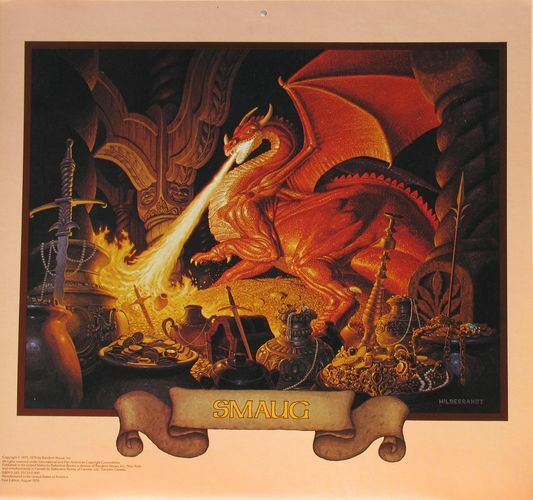 Its lengthy historical exposition is a little too lengthy, but it doesn't hamper the story too much. "Daily Grind" posits the place of a psychiatrist under the Old Ones' dominion. The madness of the protagonist's patients loops in and out of her own as she struggles to stay on the right side of her masters. Perhaps one of the blackest tales in the book as instead of tired old monsters it looks at how a person's soul is twisted in a time when the stars are right and all the angles wrong. L. K. Whyte's "What Songs We Sing" holds out the slenderest reed of hope against the Old Ones, as a woman manages to escape to the countryside. Adrian Simmons, editor extraordinaire of Heroic Fantasy Quarterly (and a friend), brings on the mayhem with "Dilution Solution." The surviving remnants of humanity live in deep underground warrens. Soldiers augmented with cybernetic enhancements lead raids into the world above. In this tale, one of them sidelined by a failed psych eval is itching to get back into the fray. 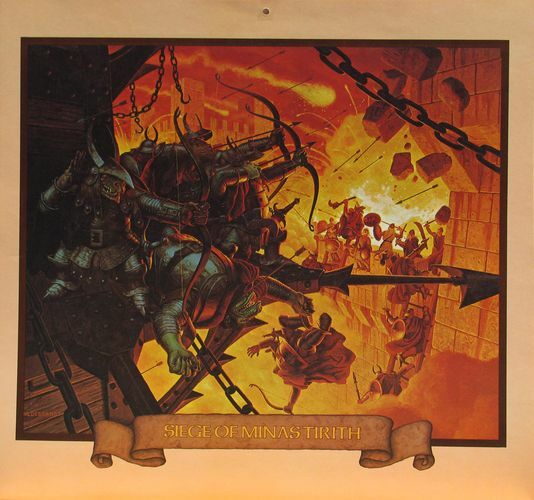 Unlike the previous tale, this one holds out no hope, only madness. "Earth Worms" by Cody Goodfellow, editor of last year's Deepest, Darkest Eden, a collection of Clark Ashton Smith-inspired stories, posits the real purpose of humanity: preparing planets for the cockroaches. A mutated girl, tries to escape the control of Empress Tsan-Chan, in Joshua Reynold's "Eliza." I won't claim to understand exactly what happened in this, but I like the mad mix of cloned Whateleys, magic, and the appearance of the Hounds of Tindalos. June Violette introduces a Dunsanian tone in "Footprints in the Snow." 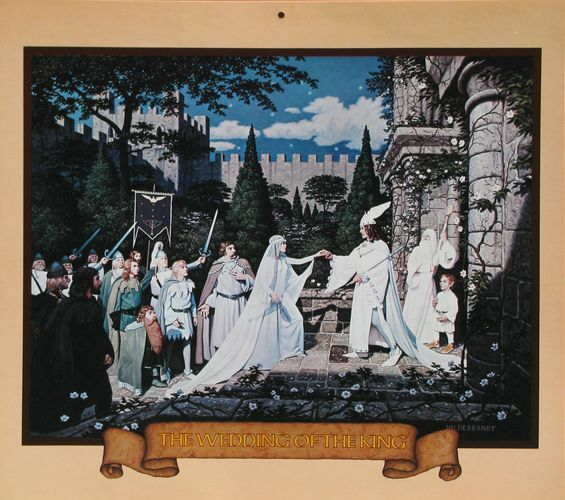 A young girl promises a new land free of terror to the children of a small town. 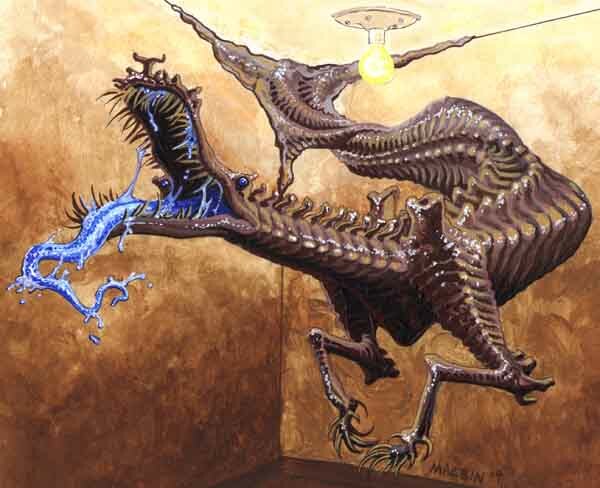 "To the Letter" by Jeffrey Fowler is about what a man and his family do when he's drafted by the Fungi from Yuggoth for immortality. Short with a double dosed nasty ending. Madness, mad gods, and drugs make set the stage for Steve Berman's Namimbian-set "The Balm of Sperrgebiet is the Krokodil." A little vague and hazy for my tastes, but reflective of the narrator's mental predicament. "Of the Fittest" by Evan Dicken (whom I've reviewed at Black Gate) is another military themed story. In this one, a veteran of Hastur's armies returns from his enlistment to find his friends and neighbors ready to draft him into the resistance. This is another existentially bleak story. Only those able to balance the coldest of equations stand a chance to survive in a world of endless insanity and misery. "Overcome" by Jason Vanhee makes clear there's as little hope for Christians as anybody else in an Old One run world. Escape is illusory in "Paradise 2.0" by Glynn Owen Barrass. Again, there is no hope whatever you might think you see or believe. Madness provides a sort of shield against the advent of the Old Ones to a patient at the Arizona State Mental Hospital in Jeff C. Carter's "The Divine Proportion." Just not enough to survive. In "The Resistance and the Damned" by Gustavo Bondoni (whom I've also reviewed at Black Gate), the Old Ones taunt a man who has tried to thwart them with murder and insanity. Jonathan Woodrow's "Twilight of the Gods" assumes the worst of some people and to what depths they will sink to survive under the Old Ones. People can sell other people to the gods who now rule the world from office suites. While I like the idea that the seller gets more money based on much the loss of the particular person they sell costs them, the basic setup feels very out of place in a Mythos setting. The closing story is "Venice Burning" by A. C. Wise. The first line, "When R'lyeh rose, it rose everywhere, everywhen." is a curiosity piquing one that is never satisfied with a story that is diffuse and unclear. For a Mythos story to be successful, for me, it must find a new way to approach material that's been mined for eighty years now. If it can catch the mood, the atmosphere of Lovecraft's not just juggling the bits of timeworn stagecraft around for the umpteenth time. Enough stories in Apotheosis manage that difficult task that I can recommend it to Mythos readers. For those not already fans of Lovecraftian stories, be prepared for darkness. There are no happy endings, no room for sentiment, nor relief. Not that it's a genre given to those things, but the despair that fills this particular volume is so dense not the least bit of light can escape its pages. 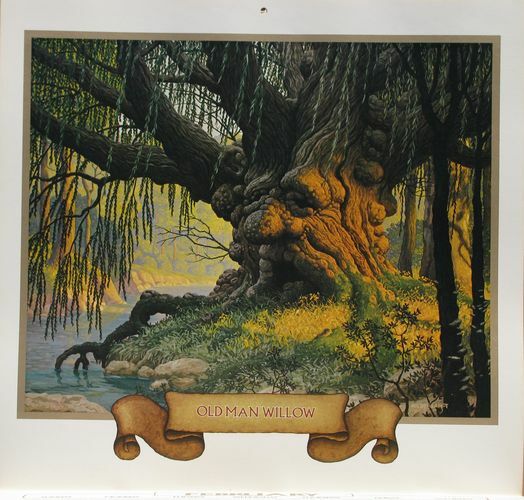 If you aren't already aware, let me tell you there's been tons and tons of art created for The Lord of the Rings. 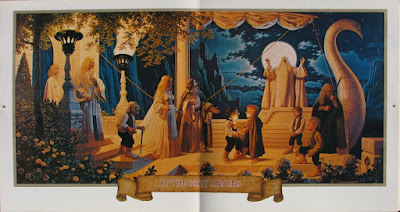 Of course there were the Brothers Hildebrandt's calendars I posted about recently, but there's so much more. 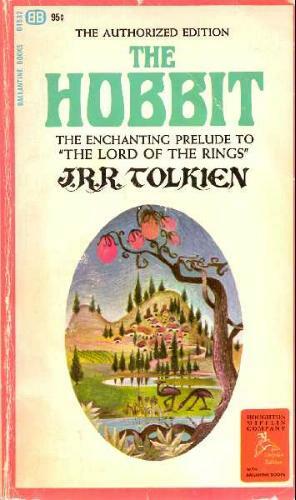 I'll start with the covers for the editions I grew up with. The first are wild, psychedelic paintings by Barbara Remington. She hadn't read the books when she created them but had to go on a synopsis from a friend. 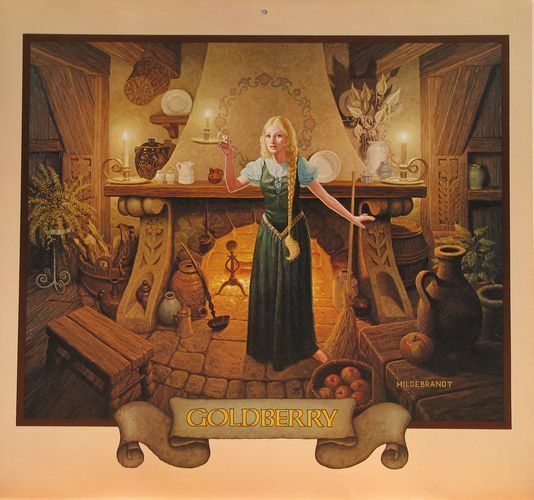 So the original cover for The Hobbit she did had a lion and fruit that looked like some sort of wild gourds. Later versions removed the cat, but left in the pumpkins. 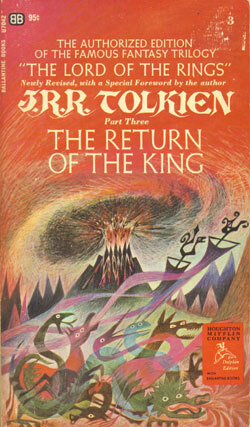 The second covers I became familiar with were paintings by Prof. Tolkien himself. I love his paintings, all washed out colors and faceted like something hand carved. I'll do a full post of his artwork soon. 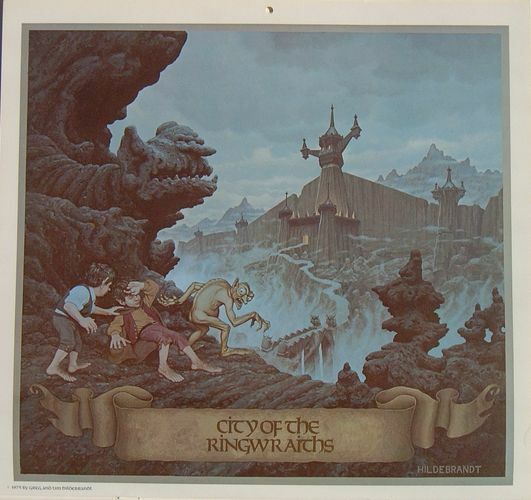 OK, Shelob and Cirith Ungol. Pretty cool. The Armies of Sauron... on crack! 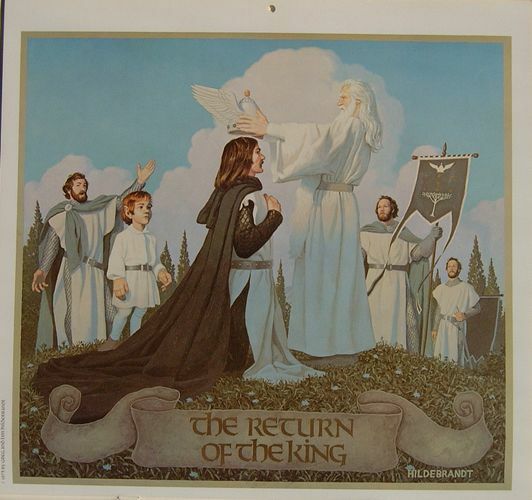 The Remington covers were so popular they were made available as a poster. 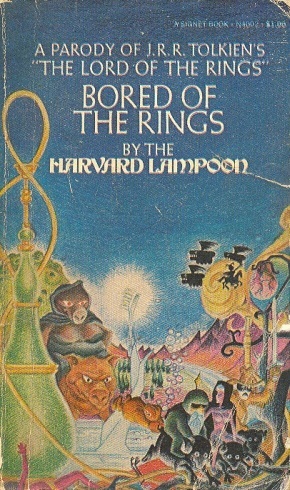 Her work was lampooned on the cover of Bored of the Rings as well. So I'm taking a break from the long 19th century and swords & sorcery and diving into epic high fantasy for a little while. I can't help myself. 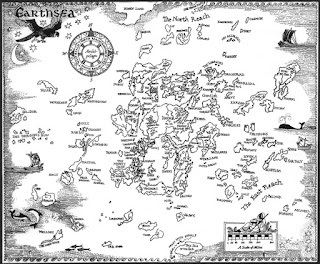 Rereading The Sword of Shannara sparked a renewed interest in big, sprawling struggles against evil. 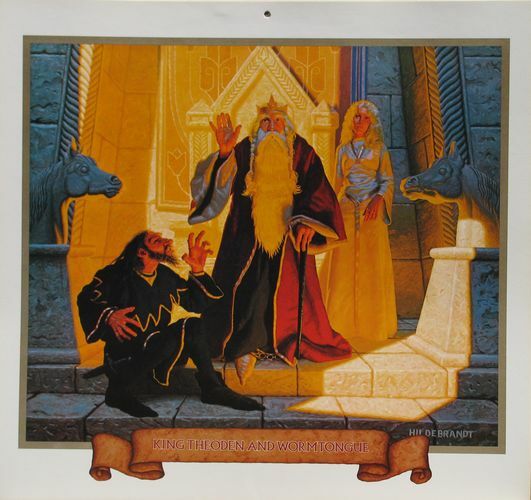 Right now I'm plunging into Stephen Donaldson's First Chronicles of Thomas Covenant. So far, it's pretty wild. Remember, big fantasy wasn't alway bad. It only got bad when fans and writers got lazy. The fans where happy with more of the same old dark lords and plucky farm boys crap and the writers were happy enough to provide them. And the publishers discovered that the fans were even happier when the series piled book on top of book. 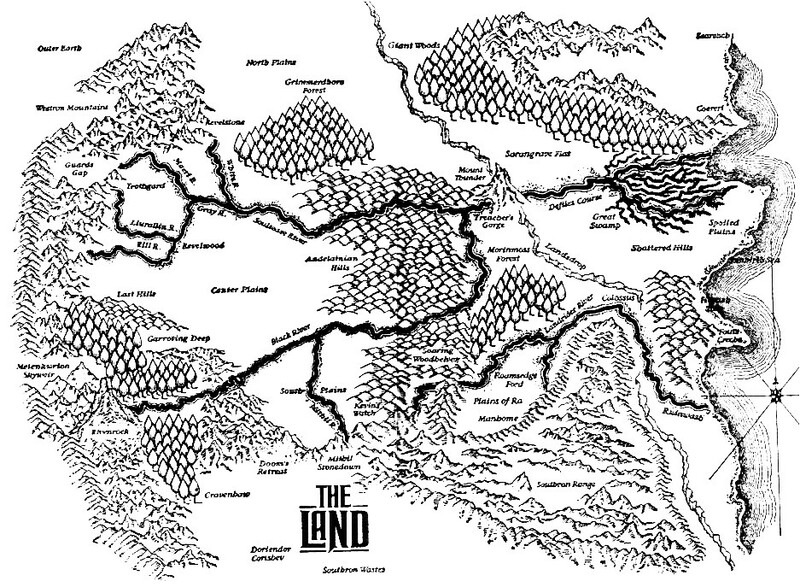 But there's good, good stuff out in the fields epic high fantasy. Over the next couple of months I'm hoping to work my way through some classic books, a few newer ones, and maybe even a few written as critiques of the genre. 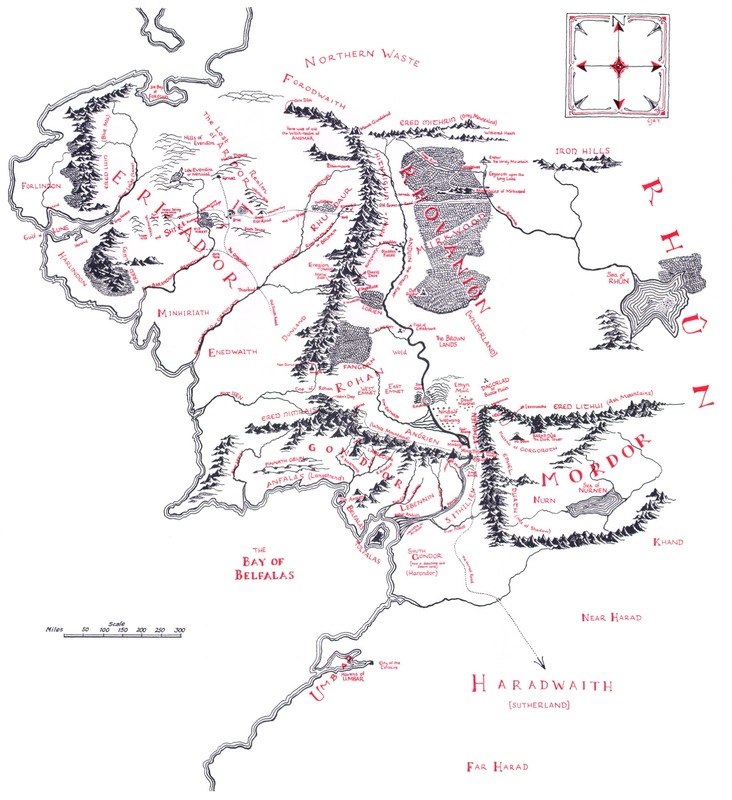 The Lord of the Rings remains my first, and truest love of epic high fantasy. 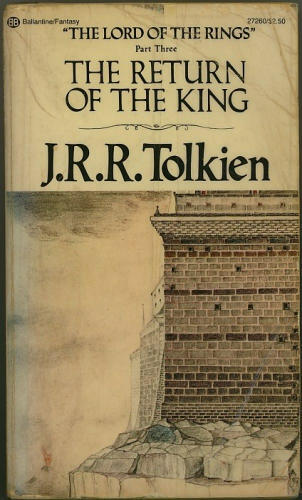 Prof. Tolkien turned me on to thick appendices, detailed maps of fictional realms, and invented languages and histories. He also elevated fantasy to an operatic scale with a deep moral underpinning, things that weren't especially important to the tales writers like Howard, Smith, and Moore told. Or at least the moral issues were grayer. They wrote darker ambiguous tales that focused on one or two characters with less clear cut relationships to good and evil. Instead of mighty thewed warriors or cagey wizards, in LotR Tolkien threw small, average men (well, hobbits) into the struggle against utter darkness. Part of the purpose of that was to depict the need for everyone to confront evil. Another was to illustrate the costs such a conflict imposes on even the victors. 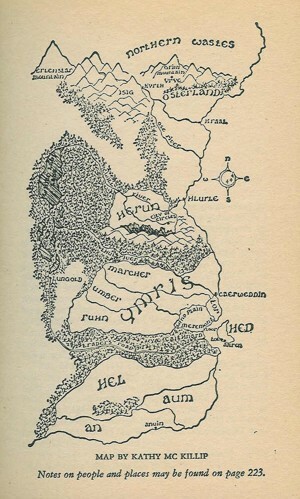 Like the great body of myths that underlay German culture, Tolkien wanted to create something similar for the English. To do this he famously developed entire languages and a history that covers thousands upon thousands of years. 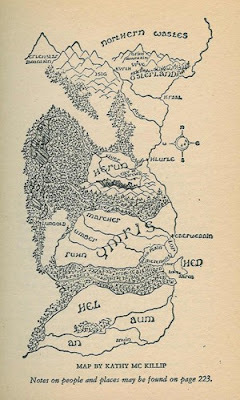 In The Silmarillion he wrote stories akin to Beowulf and Sigfried and the wars between the Icelandic eddas. 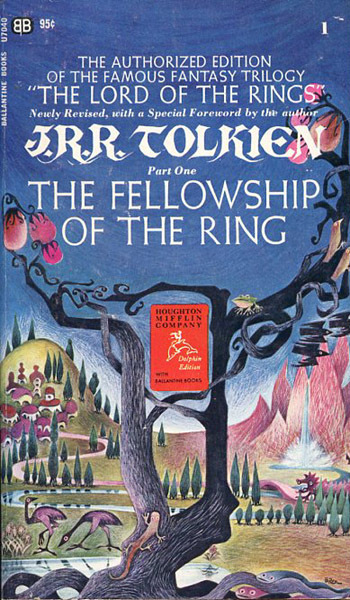 These stories would be the deep history that set the stage for the War of the Ring. 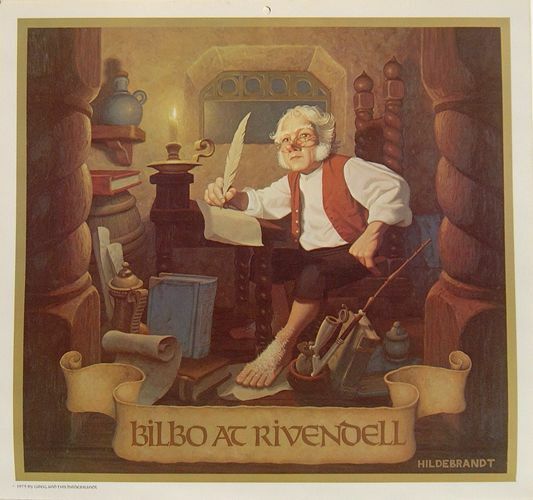 I have a great love for history and I'm sure the faux history of LotR is a big part of what made it so appealing. Discovering the appendices when I finished The Return of the King was like finding a diamond at the bottom of a gold mine. 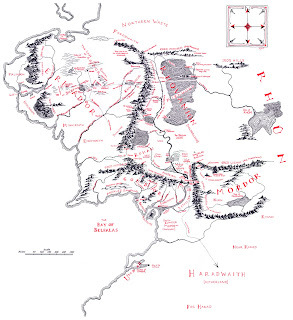 It contained just enough about great and terrible events to conjure potent images in my head: the War of Dwarves and Orcs fought in the dark tunnels below the Misty Mountains, Ar-Pharazôn's rebellion against the Valar for example. It was easy to, and I did, lose oneself in LotR. Sometimes the forces arrayed against villainy aren't pure and noble, but they still fight. 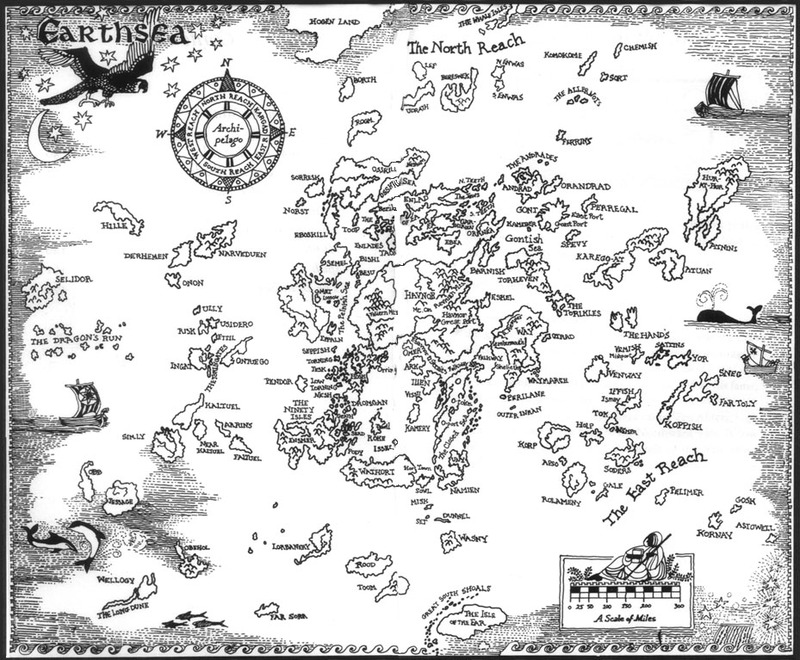 I'm all for bringing nuance into fantasy but to posit, as some authors seem to be doing, that the whole world is really only gray, strikes me as simpleminded. There is indeed evil in the world and I enjoy stories about the fight against it. 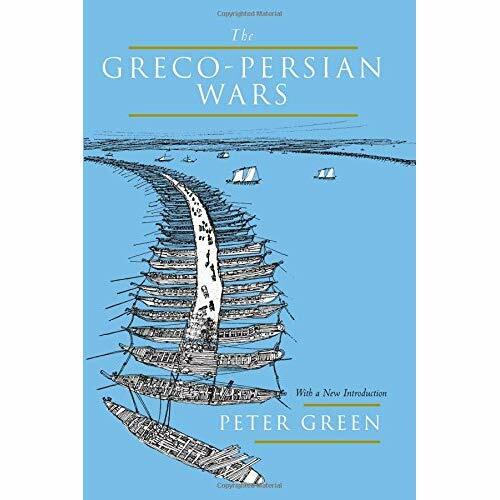 In these malignant times, when women are enslaved, men routinely beheaded, and millions driven from their homes, I think we're well served to be reminded that such forces can be fought and defeated. All of that goes into my definition of high fantasy, a term coined by Lloyd Alexander in an essay titled "High Fantasy and Heroic Romance." It is set in an imaginary world and there is at its heart a struggle against the forces of evil that are set to overwhelm it. 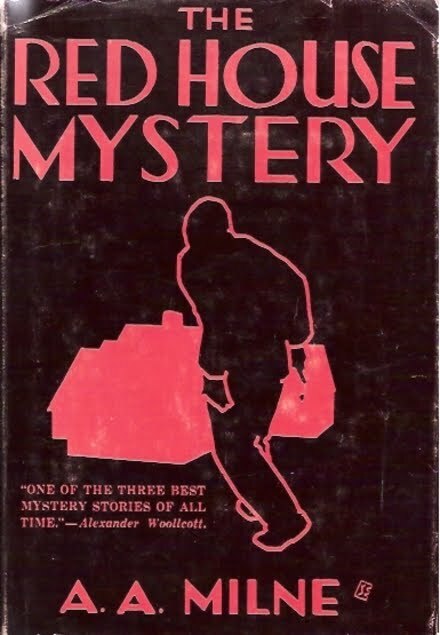 Right now, investigating some of the genre's works I have read as well as some I haven't yet is what interests me right now. It's a genre that's taken hits over the past decade. 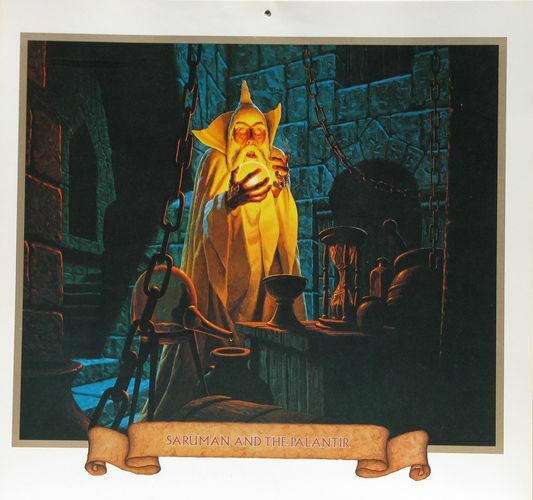 It's been criticized for reducing the world to a simply Manichean struggle, racism when it creates "evil" races liked orcs, endlessly reusing now-tattered props like the simple hero, wise sorcerer, and dark lord. There's some truth to all these claims. 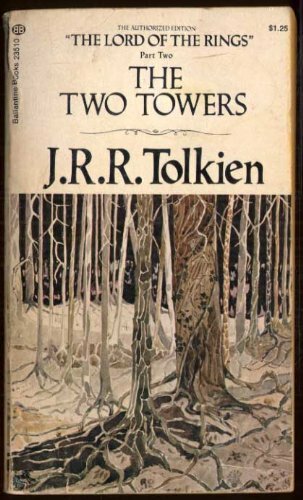 Often, though, the failures came from the pens of authors who picked up the trappings of LotR but neglected to look at its deeper themes and construction. Even today, when the genre has supposedly passed by such stories of good vs. evil told on a massive scale, its impact is still evident. 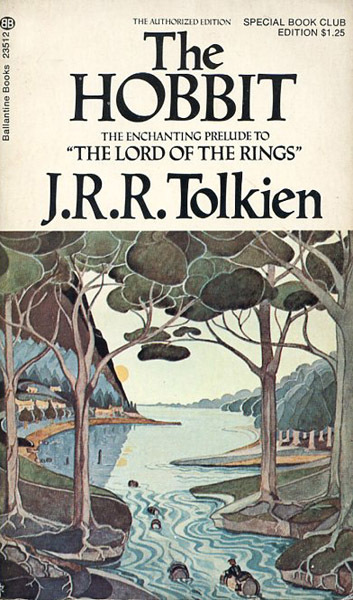 In a 2009 essay, Richard K. Morgan disparaged Tolkien claiming his heroes were "Irritatingly Radiant Good" and his villains "Towering Archetypal Evil." So when I read his novel, The Steel Remains, I was more than surprised at the essential heroism and willingness to fight evil of his trio of heroes and the blithely evil villains. No doubt he thought by making his characters cynical and brooding he was somehow bettering Tolkien but there's still no doubting they're the good guys. 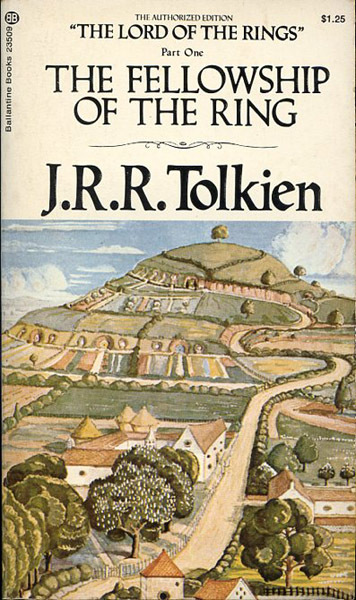 George R. R. Martin has made clear he is a fan of Tolkien and wanted to combine big fantasy with what he sees as more realism. 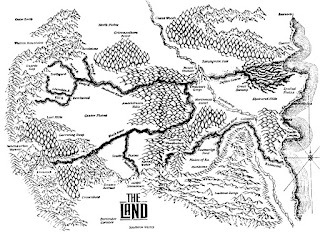 R. Scott Bakker's bleak (by which I mean like the blackest night when the stars, moon, and sun have all been snuffed out) Second Apocalypse series is heavily influenced by LotR, including its own versions of orcs, dragons, and trolls (sranc, wracu, and bashrags if you care to know), and has a map that looks like it might have come from the pen of JRRT himself. In case those of you who remember how I've long railed about all those thick books and endless series of fantasy novels, let me say I don't hate them all. I hate the ones that can't justify their length by the strength of their prose or storytelling. And that's most of them. Epic is a question of scale, not length. Worlds at stake and struggles against the forces of evil are what matter. 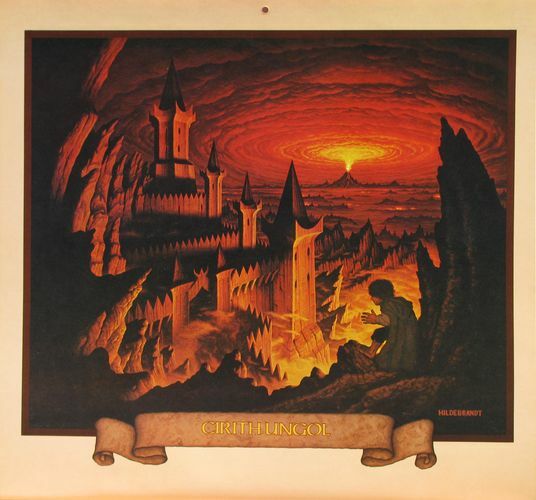 In five short books, Lloyd Alexander's wonderful Chronicles of Prydain put the whole known world at risk. Joy Chant's Red Moon and Black Mountain does the same thing in a single volume. Glen Cook's original Black Company trilogy is monstrously epic and under a thousand pages. 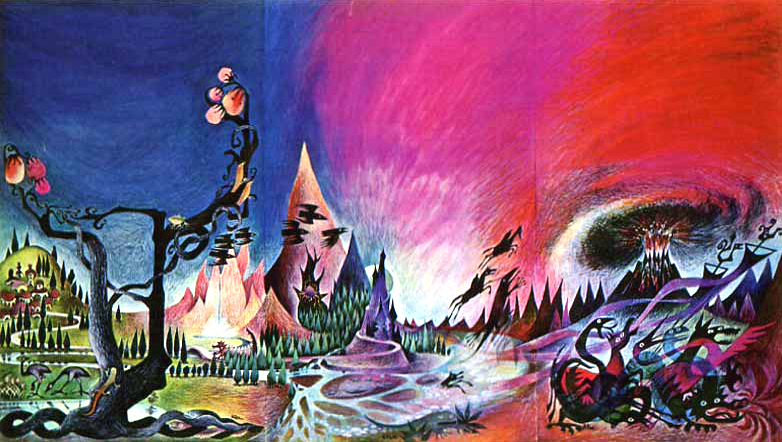 More recently John Fultz did epic in his three Books of the Shaper. So that's what I'm working on these days. 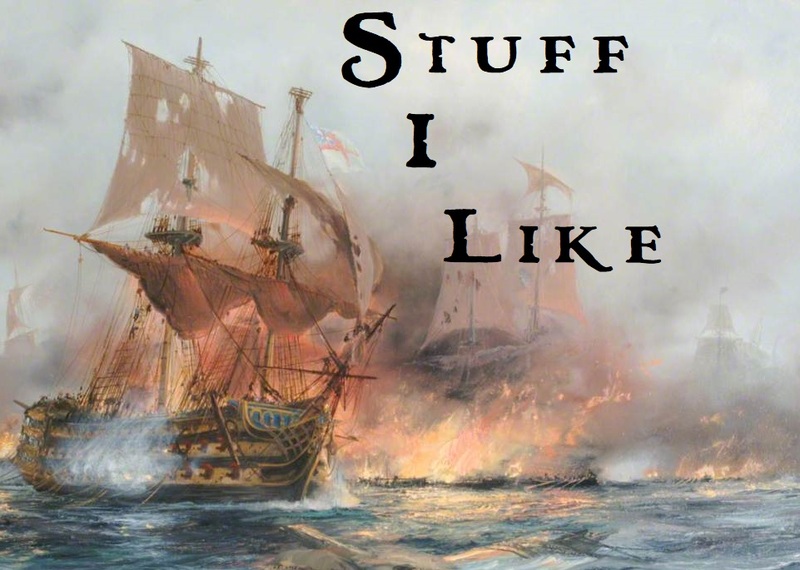 And I am still reading the long 19th century stuff, but this is going to take up lots of my reading and writing time so I figured why not give the site a new look to herald that? Enjoy! 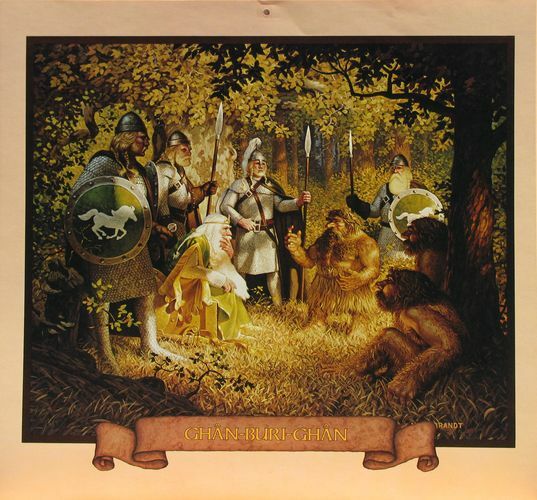 Here's the final Brothers Hildebrandt's 1970s Tolkien calendars. It's as good as the second one and suffers from the same flaws. 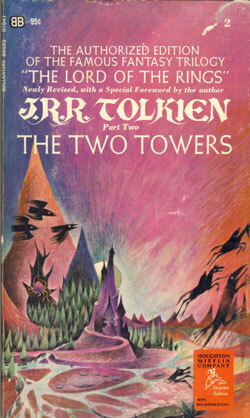 This could have been done by N.C. Wyeth if Scribners had published The Two Towers. 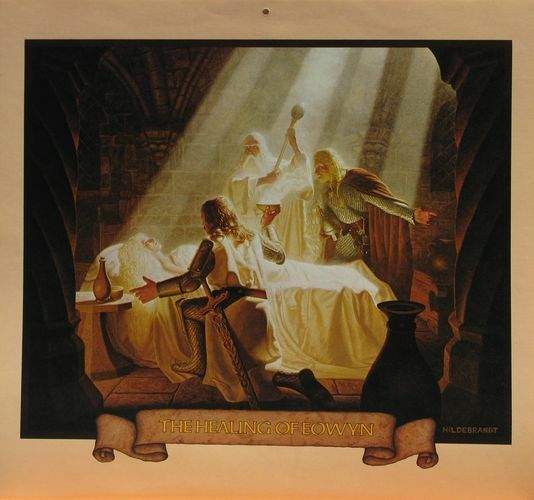 I'm not sure I like that weird thing Gimli's wrist is doing as he points. Like a photo of a set on a stage. I don't especially like this picture, but as usual, the Brothers' command of light and shading is impeccable. 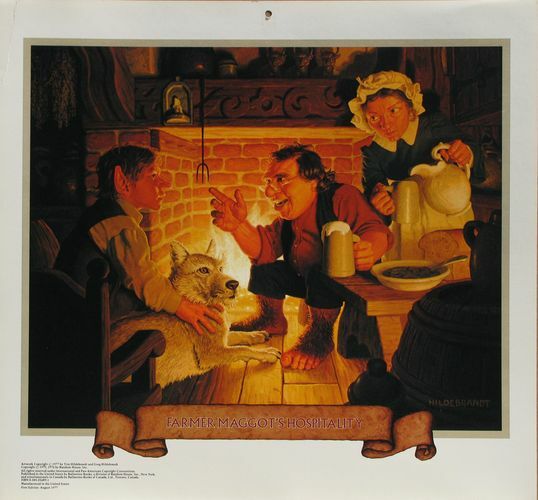 I love this bit of hobbit domesticity and friendliness. But what's that dog looking at? Part of me wants to like this but I just can't. Even Merry and Pippin aren't dumb enough to sit under that tree. At least I like the grass, trees, and cliffs. The people not so much. 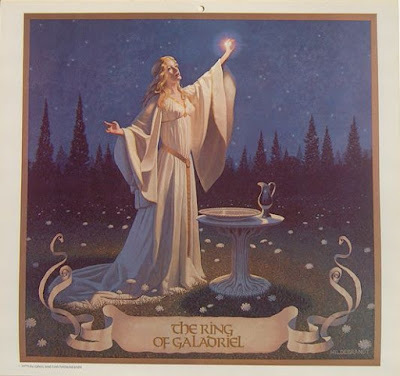 Galadriel's gown looks like a nightgown. Too cartoonish, as I've written before. But creepy, so that's alright. Channeling Wyeth again, I love the light and the scenery. Again, the peopl not so much. 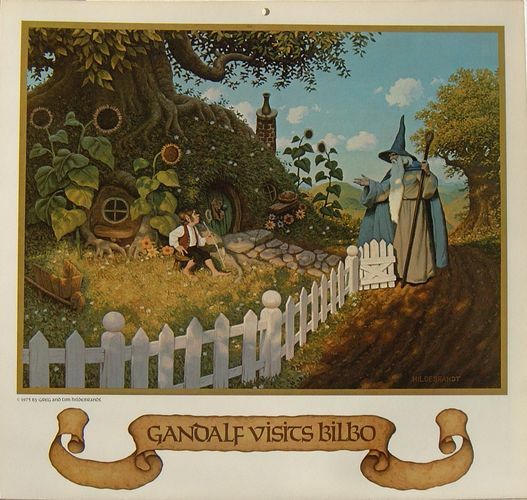 I'm really hating Aragorn's hat and seventies mustache. EVIL! A little over the top. Perhaps it's supposed to be during the siege of Isengard and he's gone around the bend a wee bit. 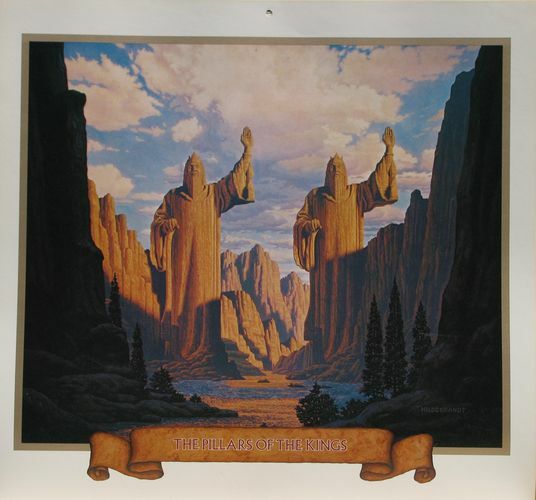 Meduseld against the White Mountains. You can feel the massive weight of the stones though I'm hardpressed to see that roof as made of hay. 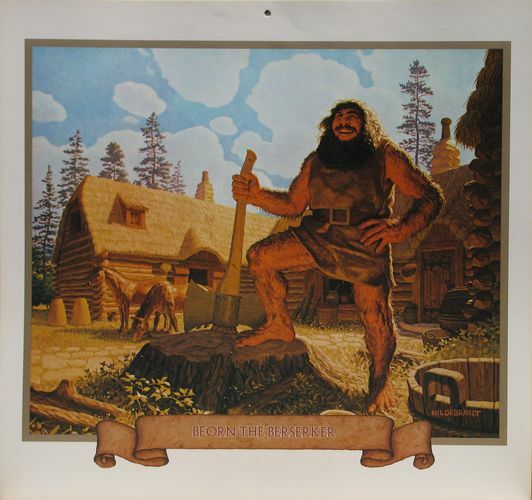 That's our Beorn! Yep, that's how I picture him, not Peter Jackson's terrible vision. How out of it would you have to be to listen to THAT man? Still, I like Theoden, his infirmity implied by the cane and the slight hunch to his shoulders. 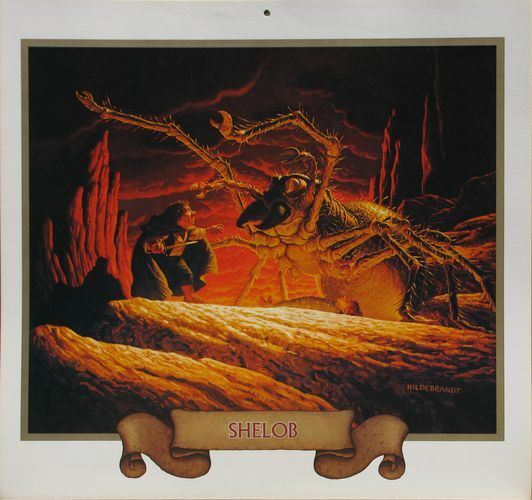 Should Shelob be bigger? Don't know and don't care. 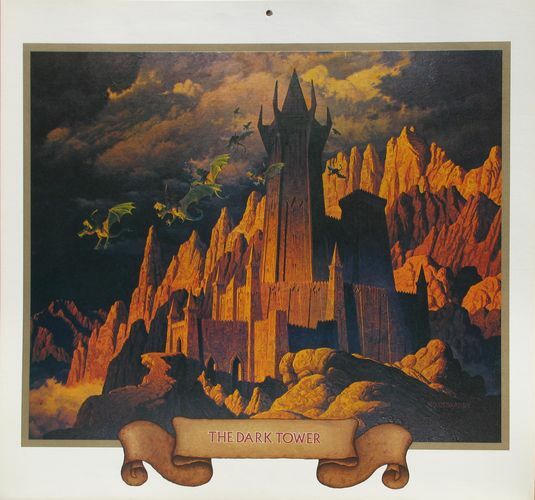 I like this a lot though I wish it shared fewer architectural similarities with the depictions of Minas Morgul and Cirith Ungol. 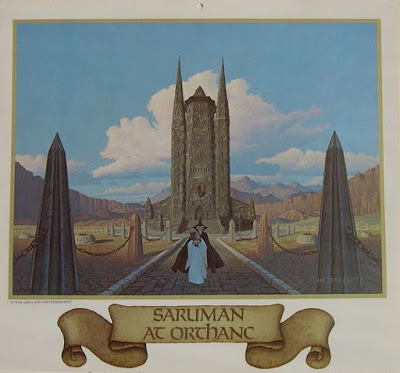 Unless, maybe, Sauron used lots of Numenorean builders in constructing his home. I really like the line of fell beasts descending from the clouds, like a string of airplanes lining up and waiting to land at Newark airport. So there's your blast from the past, when Tolkien ruled the fantasy roost and the Brothers Hildebrandt were supreme. 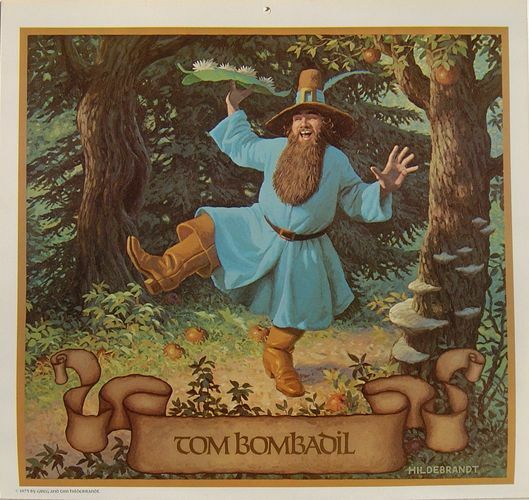 I've seen some of their later Tolkien painting and they are disappointing. Their figures became even less natural looking and overall the painting slicker and less attractive. 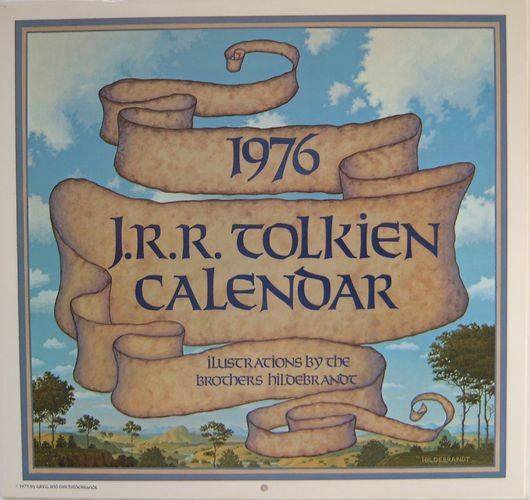 The 1976 calendar sold well enough that they were hired to do it again. While it still has its share of weak illustrations, the '77 calendar is better than the '76 one. 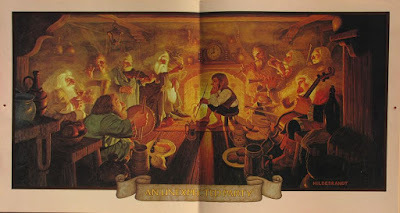 I like the Scandinavian look to the dwarves' tunics and that Gandalf's shown hunched over under Biblo's low ceiling. Of course, it is missing a few dwarves. More muscular than the picture of Smaug on Tolkien's map of the Wilderland, but I love this one. Much better than the painting of her husband on the previous calendar. They captured a great sort of Heidi-hippie girl vibe that's perfect for her. 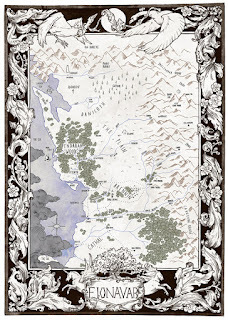 I like this, but it's a terrible depiction of Imladris. 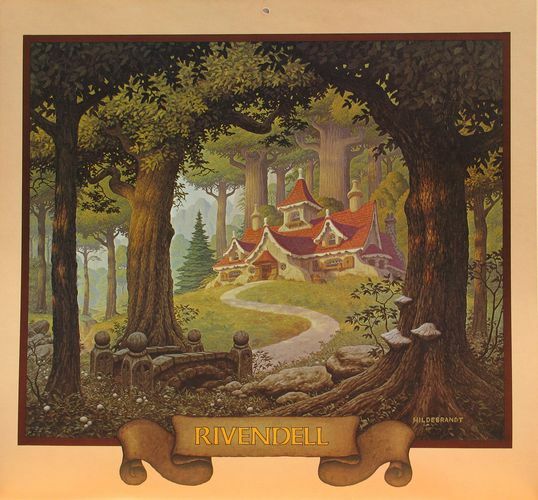 It looks more like the mountain home for the witch from Hansel and Gretel than Elrond's refuge. 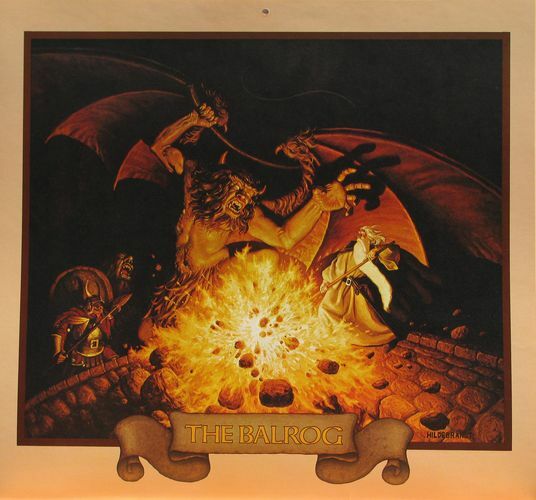 It's cramped and the bridge is too wide for my taste, but it's the first illustration I ever saw of the balrog. So I like it. Perhaps too clean, but I like its strangeness. I love the mallorn trees' straight vertical lines and the symmetry of their branches. 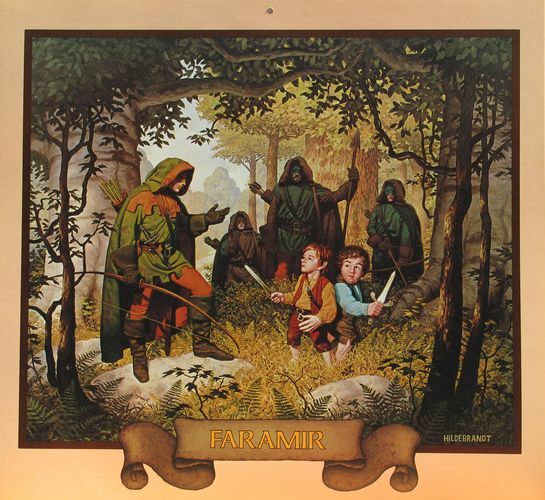 Frodo and Sam look a little too childlike but Faramir and his rangers look perfectly frightening hidden by shadows. 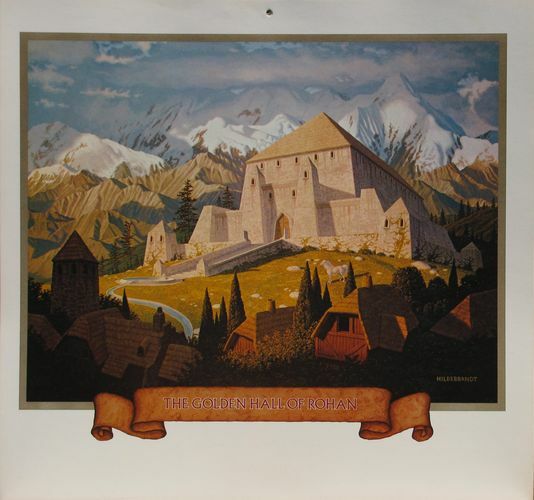 Like in the painting of Minas Morgul in the previous calendar, they give the the fortress a non-European look. Love this one. First, it's an interesting scene to choose. It's just two kings talking as it were. 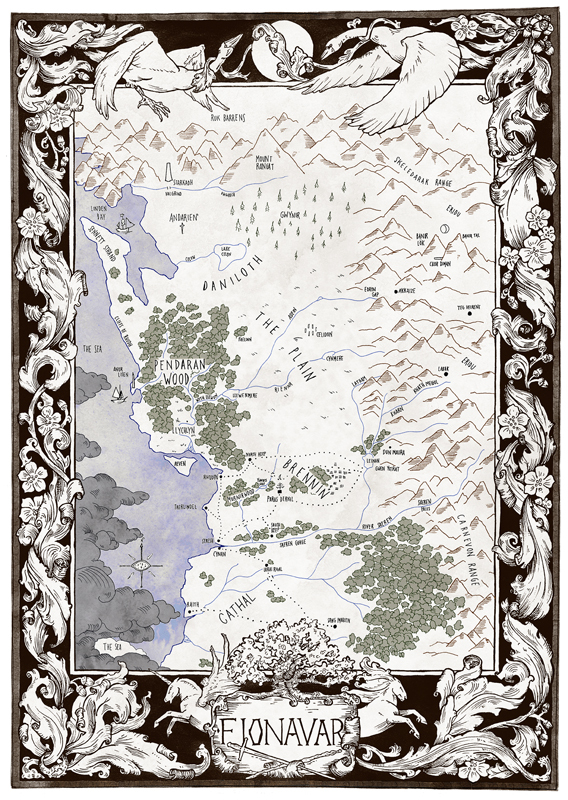 This time around the Rohirrim look much better, looking much more Dark Ages German than before. Pig orcs attack! And how. Big and explosive and nobody skiing down the backs of ludicrous elephantoids. While it's too static, I like this. The Hildebrandts' command of light and shading is on wonderful display. It looks like the veneration of a saint on her death bed. If I was a hobbit, I wouldn't want to go in there either. The blast from Mount Doom is nicely apocalyptic. It's got the angular construction again, reminding you that it was built by the men of Gondor, not Sauron. The Hildebrandts are in full Parrish mode here. It's stagey and everyone looks badly posed. Today, if you asked me who was my favorite Tolkien illustrator, I'd probably say Alan Lee or Angus McBride. 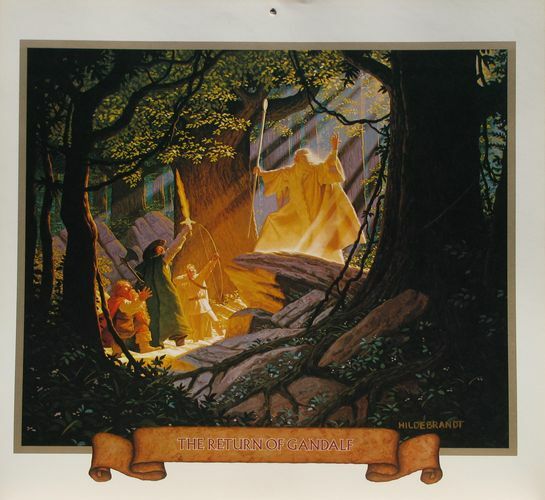 But if you asked me who had the greatest effect on how I visualize Tolkien's stories there'd be another answer: the Brothers Hildebrandt. I'd love to say my mental images of LotR come completely from my own imagination and Tolkien's words, but that would be a lie. 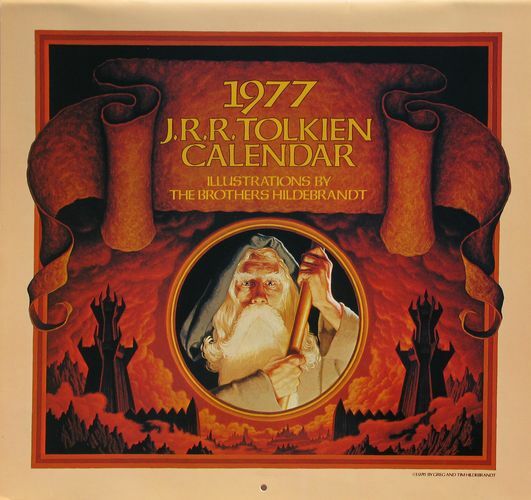 The Brothers Hildebrandt (Greg and Tim) painted three very successful Tolkien calendars back in the seventies ('76,'77, and '78'). 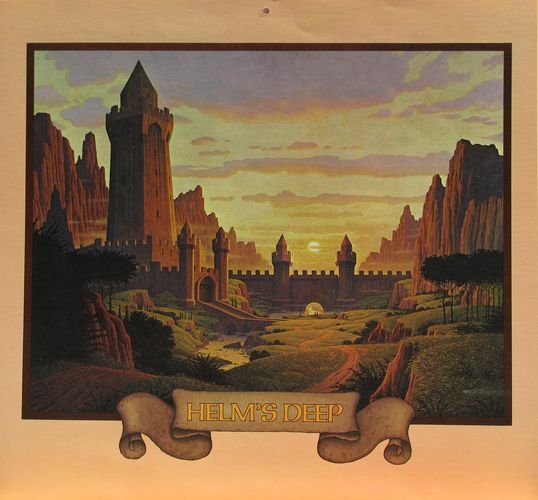 To say they helped form my own mental images of The Hobbit and The Lord of the Rings would be an understatement. By their ubiquity alone they would have impacted me, but many of them are simply downright terrific. 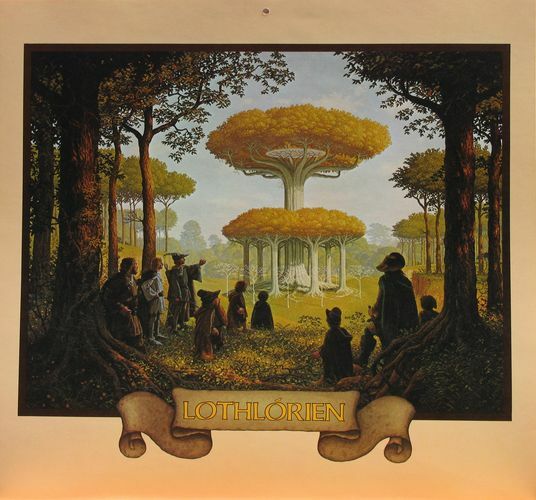 To this day some of the Hildebrandts' pictures loom over any rereading I do of Tolkien. Their paintings are a little more cartoonish than either Lee or McBrides, the former's being more impressionistic, the latter's like the classic illustrators like Pyle and Wyeth. I never particularly liked the thick folds of the Hildebrandts' characters' clothing. Too many of their larger illustrations are static, and look staged and lifeless. Or the pig orcs. Man, do I hate the pig orcs (but the pictures featuring them are sensational, nonetheless). What the Hildebrandts' art does have is vivacity and, whether bright or dark, bold colors. While Lee's illustrations are washed out and seemingly eroded with age, the Hildebrandts' are sharp and nearly every line clearly delineated. They would also look great on the side of a van or giant black light poster. 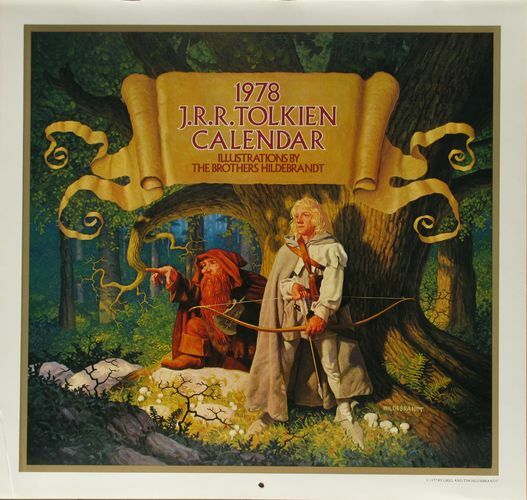 Without further ado, here're the pictures from the 1976 Ballantine Tolkien Calendar. '77 and '78 will follow in the next couple of days. This is the weakest of the three calendars. Still, they made some interesting choices of subjects and all their positive hallmarks are present. Ok, this is little doofy. But then, Tom's a little doofy. See the folds of Strider's tunic? Too thick, I tell ya'! 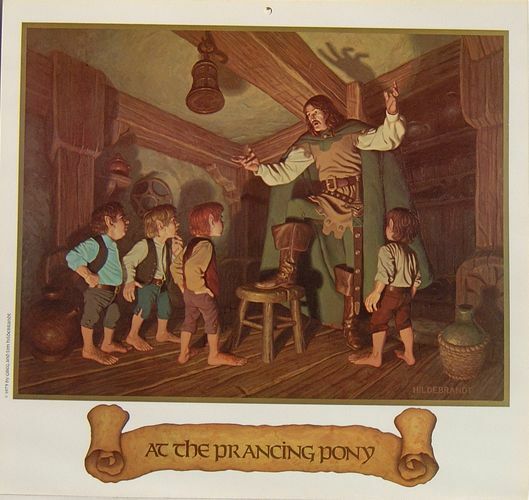 But I love his scary hand shadows on the ceiling and the massive size difference between him and the hobbits. The thoughtful gentleman memoirist amongst the clutter. I don't love this one. 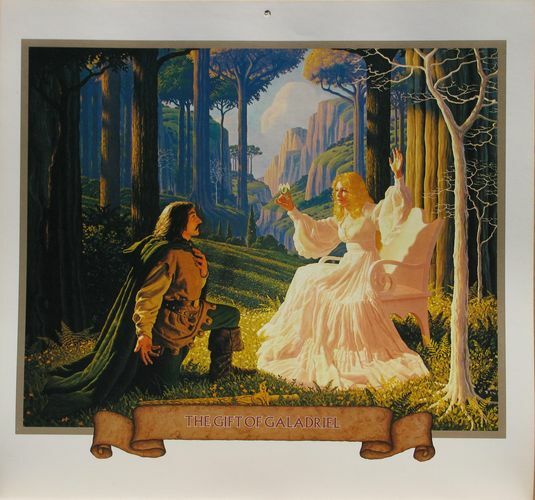 It looks like a weak Maxfield Parrish and Galadriel lacks any of the sort of grave majesty Tolkien ascribes to her. Pic orcs debut (maybe). 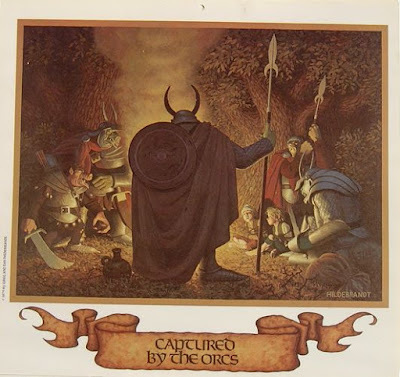 Trying to discover the source of this depiction of orcs, it looks as if this might be their first appearance. Gary Gygax attributed some sort of miscommunication with David Sutherland to them looking like this in the original Monster Manual. Still, it illustrates Merry's and Pippin's predicament well. 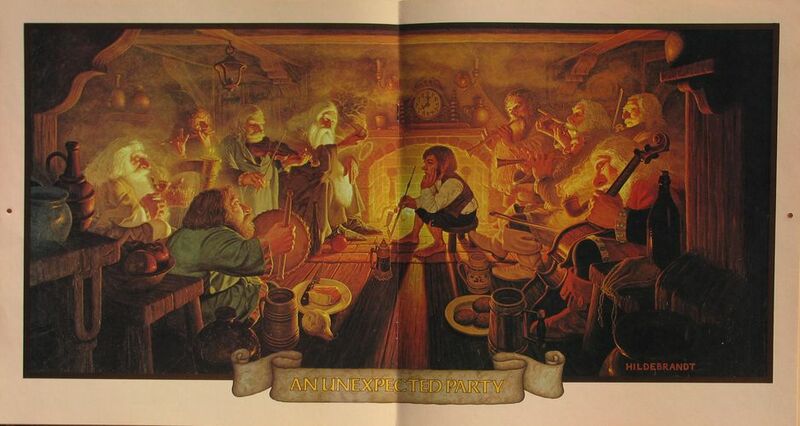 One of my favorite illustrations of LotR bar none . 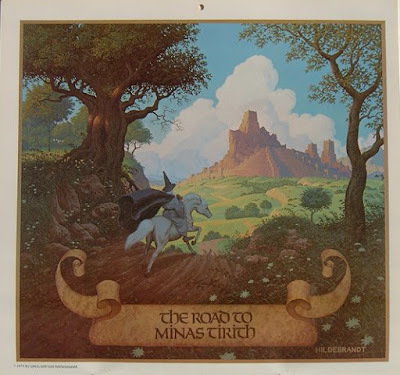 The description of Minas Tirith floored me when I first read it. Here, presented with little detail, all you can really tell about the city is that's it's built to epic proportions like some wonder of the ancient world. Don't love this. 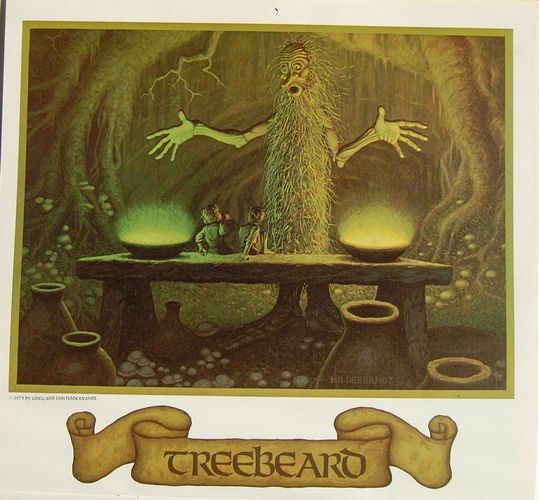 Treebeard looks way too much like Gilbert Shelton's Phineas Freak. Nothing to say, really. I like the glassy, oddly carved surface of Orthanc and the official looking pillars and chains surrounding it. 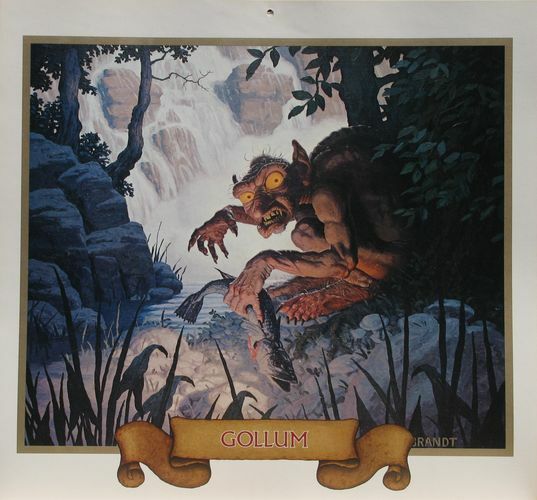 Gollum's a little too cartoony, but Minas Morgul (ne' Ithil) is perfect. Its architecture looks distinctly non-European which is a nice change of pace for fantasy illustrations. Almost perfect. Eowyn's armor is a little too High Middle Ages instead of Volkswanderung Gothic-cowboy. I love the Witch-King's iron crown and the fell beast. Plus, the cloud filled skies and the shadow covering Eowyn's lower body. Good stuff. Again, the blue of the sky and the cloud's various colors reminds me of Maxfield Parrish. I don't particularly like this picture. When I wrote some of the Hildebrandts' art was too static, this is a perfect example. While there's movement implied by the leftward sweep of the banner, the characters look like they're holding exaggerated poses they've been asked to hold too long. I'm not sure what Frodo's looking at but I think it's somewhere past Gandalf's waist. 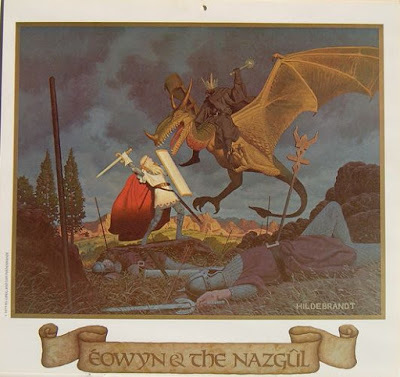 That's Angus McBride's even better Eowyn and the Witch-King on the right. There's a greater sense of motion, Merry's there in the foreground, and the corpses are grimmer looking than in the Hibdebrandt's painting. McBride also does a better job with the armor and putting the white horse on Eowyn's shield. That's something the Hildbrandts got better at doing in their later pictures.